mikeghouse May 15, 2013 May 15, 2013 Comments Off on So what if Boston Terrorist is a Muslim? It is time for Muslims to face these situations boldly and hopefully put an end to living apologetically and in fear. 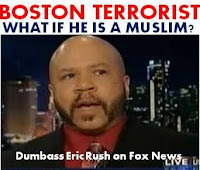 So what if the terrorist is a Muslim? Stereotyping Muslims no more! Here is a beginning of a series of articles and work geared to fight stereotyping any American be it a Muslim, Jew, Gay-Lesbian, Immigrant, African American, Hindu or Sikh American. The following article invokes common sense to those who thrive on chaos and prefer to aggravate it further, rather than restore the society to normalcy. It is for those who are anxious to turn their frustrations into blaming anything in sight including Obama and Muslims. Consider another scenario; if a single woman wants to move from Seattle to New York or Dallas, and asks your recommendation. Based on statistics, would you say – don’t go to New York, they are murderers. In 2010 they murdered 866 people, and sure don’t go there, they are rapists, they raped 2, 771 women. If you are a New Yorker, how would you feel your categorization? Just as the New Yorkers and Texans would feel outraged, Muslims ought to feel the same. Should New Yorkers apologize to this woman from Seattle for the rapes and murders in their state? Should Texans do the same? Should a Muslim apologize for the acts he or she did not commit? The answer is hell no! We are one nation under God and we need to think, talk and act as one. Are you saying that the Muslim community is permitting these criminals to go kill? Was the New Town killer authorized by the Christians to go kill children! Did Americans Authorize KKK and White Supremacist to Kill? Did Christians authorize 50 some mass murders in the United States to run their automatic weapons in Colorado, Wisconsin, Oregon? Were the peaceful Buddhists Monks in Myanmar authorized by the entire Buddhist world community to murder their fellow Muslim citizens? Your question is pretty dumb. Mike Ghouse is a speaker, thinker and a writer on pluralism, politics, peace,Islam, Israel, India, interfaith, and cohesion at work place. He is committed to building a Cohesive America and offers pluralistic solutions on issues of the day at www.TheGhousediary.com. He believes in Standing up for others and has done that throughout his life as an activist. Mike has a presence on national and local TV, Radio and Print Media. He is a frequent guest on Sean Hannity show on Fox TV, and a commentator on national radio networks, he contributes weekly to the Texas Faith Column at Dallas Morning News; fortnightly atHuffington post; and several other periodicals across the world. His personal site www.MikeGhouse.net indexes all his work through many links.